Who is Bell? 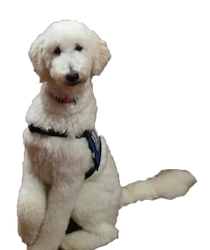 Bell is an Endeavor service-trained dog specifically trained to provide comfort and companionship to children, adults, and elderly. She is calm and longs to cuddle. What kind of dog is Bell? Bell is a doodle, and does not shed. She has been trained in a home with very young children who have special needs. Her mission is to serve and be a working member of a learning community. How old is Bell? She is 8 months old. When will Bell be at TPS on a regular basis? Beginning Wednesday, October 12, following the long fall weekend, Bell will have an area within the Primary School Office where she will have her bed and water. She will not have access to the hallway or health office. Will Bell be able to be off her leash at school and walk around on her own? No, Bell will never be off of her leash and will always be accompanied by a specific faculty member. In consideration of Bell’s needs, she may not be checked out or picked up from the primary school office and taken to a classroom without prior notice. How do students and faculty arrange time with Bell? Please call or email the primary school office, and we will arrange for Bell to spend time with a student(s) or come to a class. She will be with us as a regular member of our community, so there will be more than enough time for everyone to begin connecting with Bell. It will take time, and we have that! What if a student or faculty member is uncomfortable with having a dog near them? Please be assured that Bell will not be roaming and will only be invited to areas/rooms where the teacher knows all students are comfortable having a dog, on a leash, in their area. • Bell will eat her meals in the morning/evening, so will not eat anything at school. Birthday treats, table food of any kind must not be given to Bell. She will never be brought into the dining room. • Bell is a well-trained, yet young dog who will run joyfully and quickly for fun, so she must never be off of her leash. She will run away, to have fun, and not yet know how to return. Bell will acclimate beautifully to her new job at The Prairie School and will do so very quickly if we all support her needs and respect her as a fellow member of our community.